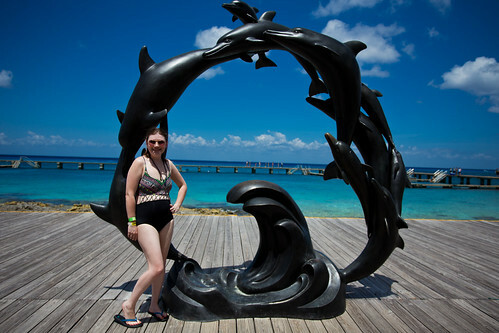 My recent voyage on the Royal Caribbean Liberty of the Seas stopped in Cozumel, Mexico for a day at port. 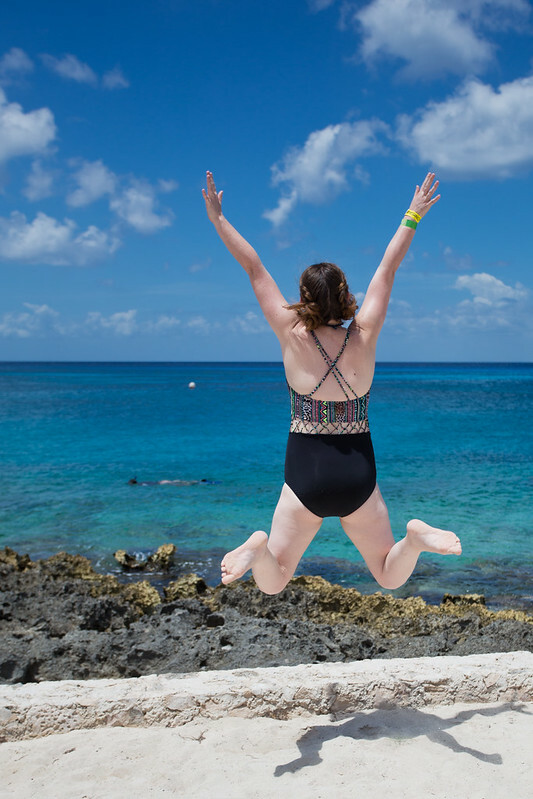 I decided to do the Dolphin Push, Pull, and Swim excursion at Chankanaab Park in Cozumel, and it was one of the best experiences of my life! I thought I’d share some tips if you plan to visit the park or participate in this excursion yourself. 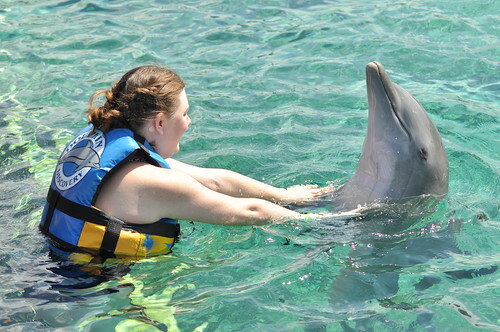 The dolphin experience excursions tend to sell out quickly, so make sure you book your excursion early! I went online to the Royal Caribbean website before sailing to book mine, and my ticket was waiting for me in my stateroom when I got onboard. It was so easy and convenient! Plus, if you book through the cruise line, there is a guide waiting for you in the port to tell you where to go and what to do. We had a dedicated guide who stayed with us all day and explained what was going to happen every step of the way. He was so funny, too! He waited at the park while we did our dolphin experience and provided transportation back to the port whenever we were ready. 2. Make Sure To Book the Right One! I chose the “Dolphin Push, Pull and Swim” excursion and NOT the “Dolphin Encounter” excursion. Know the difference between the two! 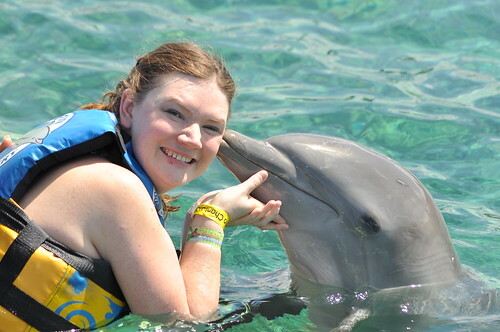 Some others on our trip chose the Dolphin Encounter, thinking they would swim with the dolphins. But they didn’t get to. 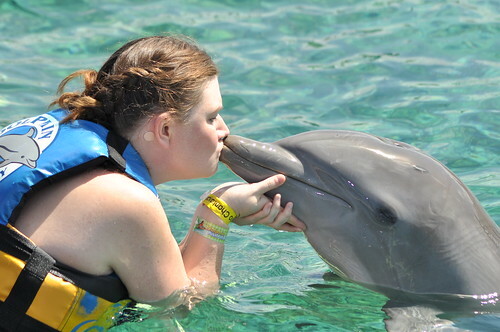 The Dolphin Encounter only includes three interactions: the Dolphin Kiss, Dolphin Handshake, and Dolphin Hug. You don’t *actually* get to swim with them! Our Dolphin Push, Pull, and Swim excursion included the previously mentioned interactions along with three others: Dolphin Boogie Board Push, Dolphin Belly Ride, and Dolphin Targeted Touch. We also got to pet a manatee at the end of our encounter, which was just one more cool thing that we got to do. It was so much fun! 3. Look for the Camera! 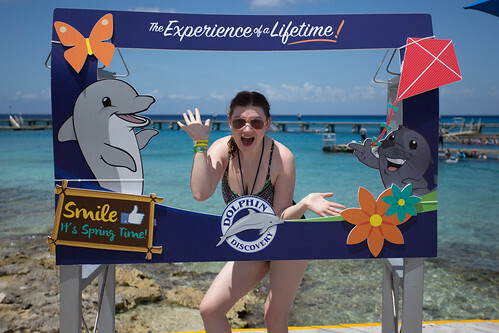 Personal cameras are not allowed in the dolphin encounter area, so be prepared to pay for photos once your experience is over. You can choose between individual prints, or a CD with all images on them. The cost of the CD gets cheaper per person the more people that are included on it. I ended up buying a CD with all of my individual images for around $80. If you don’t know beforehand to budget for that, it can definitely be a surprise! My friends elected not to purchase their images because many of them didn’t turn out. To make sure you get great photos from your experience, make sure to look for the photographer before each interaction begins. That way, you can be sure to smile or look at the camera. It makes it so much easier if you know where to look each time! 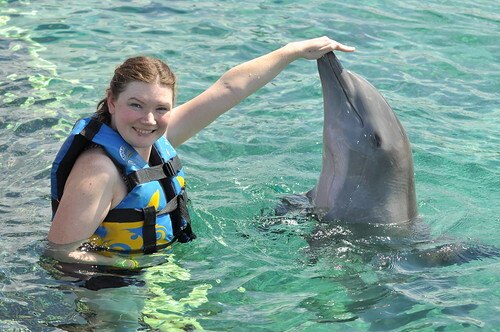 The dolphins are so friendly and cool — enjoy your time with them! 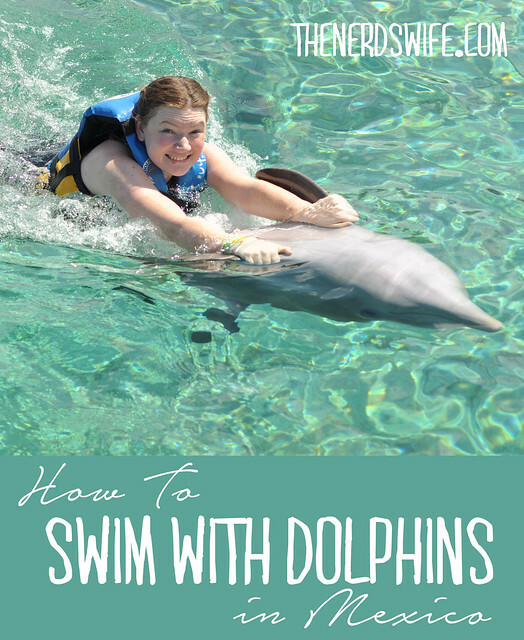 Make sure to follow the instructions from the guides, though — some people in our group would try to pet the dolphins when it wasn’t their turn and it would confuse them. 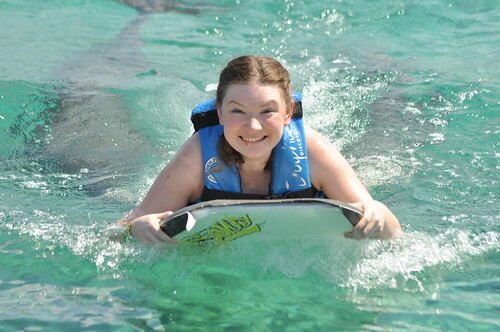 I ended up being pushed around in circles for a bit on the boogie board because one of the dolphins got confused. It was hilarious and definitely something I will never forget! This was definitely the experience of a lifetime! 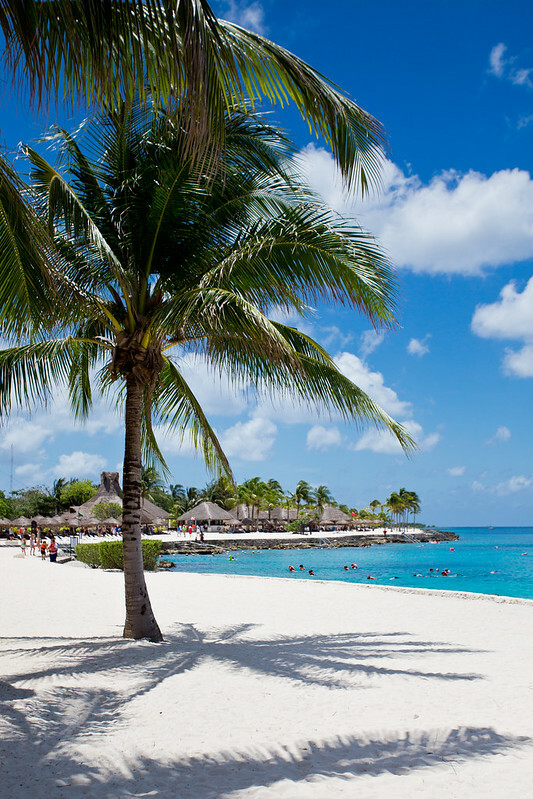 The excursion also includes admission to Chankanaab Park in Cozumel, Mexico, which is one of the best places to snorkel and swim. 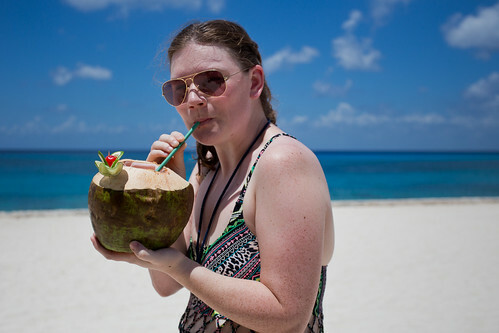 After our dolphin experience ended, we spent some time on the beach, enjoying some coconut drinks and taking in the view. It was awesome! 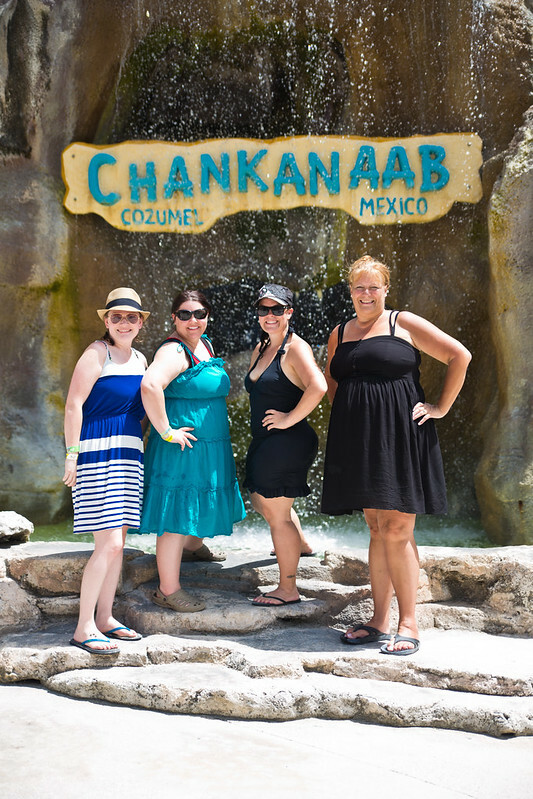 If you’ll be visiting Cozumel, Mexico, I highly recommend Chankanaab Park for some adventure and fun! 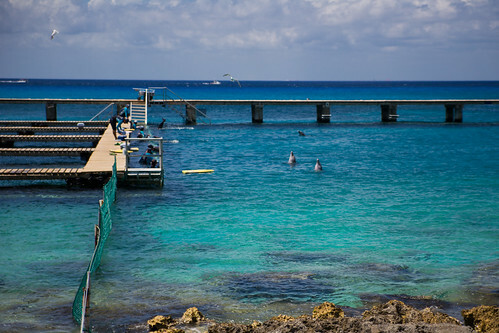 Have you ever wanted to swim with the dolphins? Looks like you had a ton of fun! 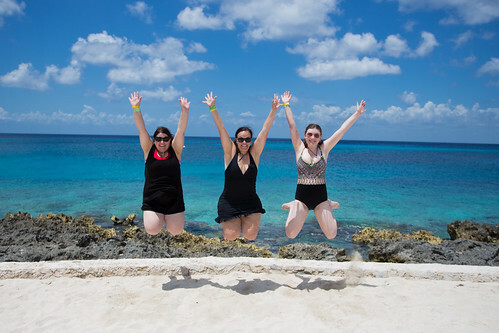 Jessica and I were a bit disappointed with our snorkeling excursion but the beach part was fun!